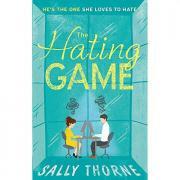 Lucy Hutton and Joshua Templeman hate each other. Not dislike. Not begrudgingly tolerate. Hate. And they have no problem displaying their feelings through a series of ritualistic passive aggressive maneuvers as they sit across from each other, executive assistants to co-CEOs of a publishing company. Lucy can't understand Joshua's joyless, uptight, meticulous approach to his job. Joshua is clearly baffled by Lucy's overly bright clothes, quirkiness, and Pollyanna attitude. But the tension between Lucy and Joshua has also reached its boiling point, and Lucy is discovering that maybe she doesn't hate Joshua. And maybe, he doesn't hate her either. Or maybe this is just another game.